Home Memoir or Autobiography What is Autobiography? Autobiography is a non-fiction writing genre. However, people asking the question “What is autobiography?” are often wanting to know the specific characteristics that make autobiography different from other non-fiction genres like memoir. So first take a look at the definitions. (definition from Dictionary.com) – a history of a person’s life written or told by that person. (definition from Dictionary.com) – a record of events written by a person having intimate knowledge of them and based on personal observation. 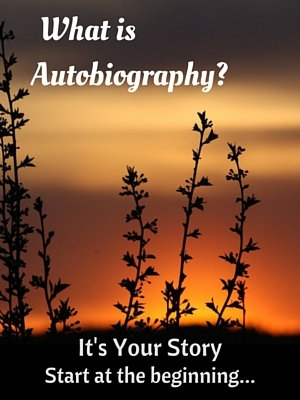 Both autobiography and memoir are written in the first person. An autobiography is chronological and covers an entire life. The dates should be accurate and the stories should be true. A memoir covers a theme, an event or a time-period in a life and is not necessarily chronological. It is less focused on the events themselves and more on the experience of the writer and/or the impact on the writer’s life. If you are writing an autobiography or a memoir for a publisher who will be selling your book, you should make sure you are on the same page with your publisher. However, if you are writing for yourself and your family, I suggest that you don’t get hung up on the definition. Just start writing about the things that are important to you. You can call it your personal history, your musings, or anything you want if you feel you need a way to describe it. The main thing is that you write it. If you are ready to start your autobiography or memoir, you may want to take a look at MemoirWorkbook.com. It’s a tool we created to make preserving and sharing your life stories easy. There are hundreds of questions to prompt your memories. You can fill in the blanks or completely customize it to fit your story. You can easily upload your photos and your story will be formatted in the style of a book. Click Here to Try MemoirWorkbook.com FREE!